Join us for a weekly bush and beach playgroup program (10 sessions) where families gather to enjoy all the benefits that nature has to offer. We provide a gentle rhythm to our facilitated playgroups with a focus on sensory play, storytelling, song, craft, learning, unstructured play and plenty of opportunities to build gross motor skills through climbing, balancing and movement. In term 2, we will start the term by exploring some new areas near Newport such as Williamstown beach and Westgate Park, as well as Newport Lakes Reserve. 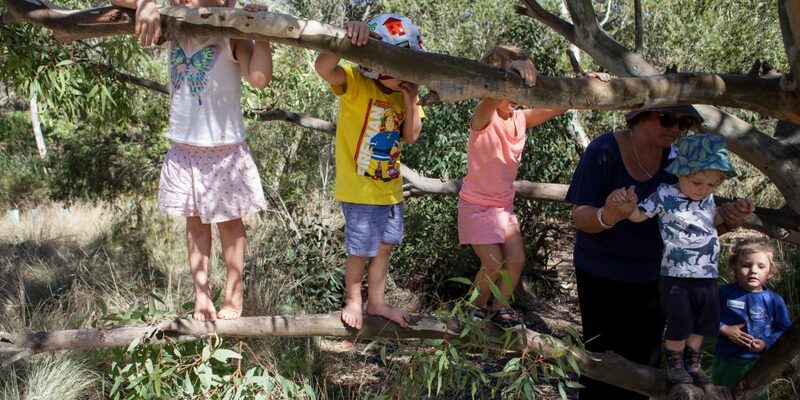 Eco Explorers bush playgroups are facilitated by qualified and experienced nature play educators (read more about our team here) that are highly skilled and knowledgeable in the area that they work in. Our Newport bush playgroup is run by Kirsti, an experienced early childhood educator who has extensive experience working with children and supporting families from diverse backgrounds. It’s the perfect inner west – city location for our bush playgroup as it’s home to an abundance of birdlife with its beautiful wetlands and lake. Ages: 1 – 4 years (siblings under 14 months are welcome to attend for free).